While I’d trained on off-road terrain and run distances of 20 miles plus in training, this was the first time I’d attempted to run the whole 26.2 miles. And having seen the profile of the terrain (see below), I had absolutely no idea how I’d cope with the combination of rugged ground, steep hills, hot weather and the competitive atmosphere of an actual race. 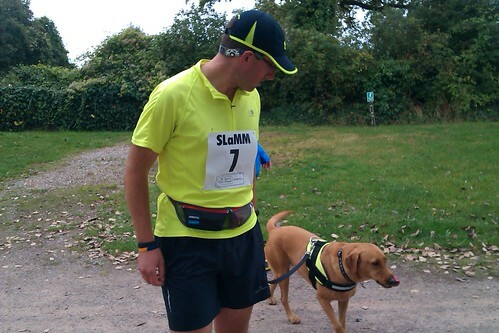 So my strategy was simple: start slow, stay calm, be cheerful and (most importantly) Keep Moving Forwards. Before the start, and having arrived with a little bit of time to spare, Molly and I did a few warm-up laps of the campsite that was kindly hosting the start and finish. As you can see from the photo below, we were sporting matching outfits for the occasion. 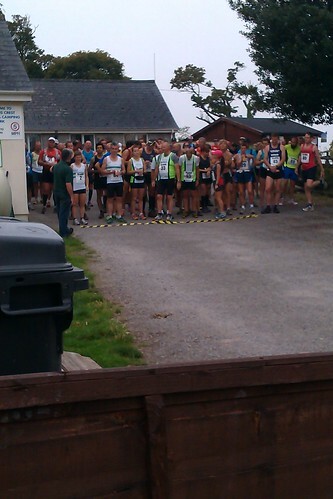 Soon, though, it was down to business, so I lined up with the other runners at the start. It was quite a small event, with only seventy-odd runners taking part, many of whom (if the tattoos were anything to go by) were veterans of things like the Marathon des Sables and other exploits. There was a broad mix of runners, but they all seemed to have one thing in common. They all looked far, far tougher and more experienced than me. So I wiggled to the back of the crowd and hoped not to get trampled when the gun went off. While I started pounding the trails and footpaths of the Somerset Levels, Natalie and Molly headed off for a morning of activities at local National Trust properties, so thankfully there are no photographs of the next four and a half hours. We started by heading down off the plateau on which the start was sited (leaving me with the horrible knowledge that, as the start and finish were are the same place, we were going to have to trudge back up it in about 25 miles time) and heading out of the village of Langport and into the countryside. The route was well signposted and there were marshals to cheer us on and to ensure that we kept going in the right direction. I did on two occasions meet runners coming in the other direction, which means that presumably not everyone managed to find the correct route first time. This did, admittedly, confuse me a little at first. But thankfully I soon got into my stride and pootled happily along river banks, across fields and through small villages. I came across quite a few farmers, ramblers and local residents along the route, all of whom greeted me with a smile and a few words. The pack was well spread out by now, but I could periodically see a couple of people ahead of me in the distance and, when the terrain was flat, some of the following runners. And every now and then I’d come across one of the marshals (often with their entire family in tow) or, even better, one of the six or seven water stations that were dotted around the course. At about mile 18, there were two fairly chunky hills to contend with. The first one was quite gradual, so it kind of snuck up on me and I didn’t really notice how high I’d climbed until I came to a viewpoint at the top. This was followed by a steep downhill section (which I only just managed not to roll down, following an incident with a rabbit hole and lack of attention to where I was running) and, inevitably, another uphill burst. This second hill had the unfortunate attribute of being (from my knackered perspective, at least) almost vertical. I could see three other runners scaling it ahead of me, looking for all the world like mountaineers on a great green glacier, so I gave myself a mental kick in the backside and joined them. Running up a steep hill like this was no longer an option, but I put my hands on my knees, gave it everything I had and eventually scrambled over the top. At this point, I tried to motivate myself my telling my body that it was now practically only a 10km run to the finish. This strategy was not massively successful, to be honest, but I did manage to keep plodding through the fields and along the footpaths, tracks and country roads that took us winding back to Langport. I think we even ran through someone’s garden at one point. As I reached the final water station at mile 25, it became clear that I could no longer put off the final climb back up to the finish. This hill seemed even worse than the ones at 18 miles, mostly because I couldn’t actually see the top, so had no idea how high I had to climb. But with a combination of short bursts of running, short bursts of walking and short bursts of thinking I was possibly about to expire, I finally broke through the trees at the top and into the fields leading to the finish. Having negotiated the last few stiles and gates (which were a common feature along the course, along with inquisitive cows and bewildered horses), I eventually rounded the final bend and saw the campsite ahead of me. And sat there on a rock was my support team, looking almost as surprised to see me as I was to see them. 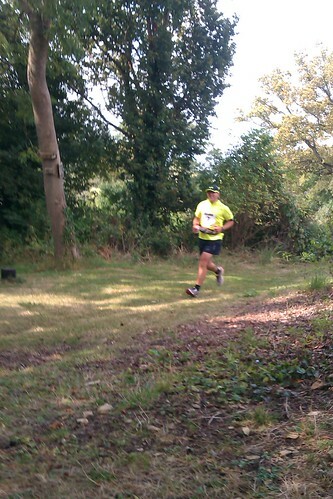 Here’s me on the home straight. There were a few twists and turns through the campsite, but I could tell from the crowds of exhausted-looking runners that I was nearly there. I scooted around the last corner, calling on all of my strength for one last effort. And with a final sprint (I’ll use the term loosely), I was over the line and free. Forty fifth out of seventy seven runners. With sore feet, trembling knees, and aching thighs… but a big smile on my face and a rather hard-earned medal around my neck. 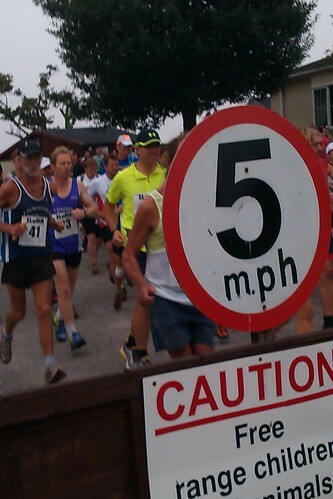 This entry was posted in Running and tagged Marathon, Running, Somerset Levels and Moors Marathon by Simon Perks. Bookmark the permalink.